Waitangi Day is New Zealand’s national holiday, falling on February 6th and commemorating the date in 1840 when the Treaty of Waitangi (effectively our constitution or founding document) was signed. The day was recently ‘Mondayised’ – before 2013 it wasn’t celebrated on a Monday if it fell on a weekend. While Australia Day and 4th July for example are renowned for their celebrations, Waitangi Day sadly is known for its protests. I won’t get into the injustice of the treaty (there are differences between the English and Maori versions of the Treaty signed), but Waitangi Day falls at the peak of the New Zealand Summer and is the one public holiday you can actually rely on for decent weather. I’ve long been a believer that it should be used to achieve something for myself. In 2013 I learnt to Surf, in 2014 I ran 8km in preparation for my first Half Marathon, and this year I headed North to walk the Tongariro Alpine Crossing with my friend Hellen. Hellen had picked up a GrabOne voucher mid last year for an ‘Epic Ruapehu Adventure’ which got us two nights accommodation in an ensuite room at LKNZ Travel Lodge in Oakune, breakfast both mornings, a $40 dinner voucher, arrival drinks and Tongariro Crossing shuttles. Our $40 voucher was for The Cyprus Tree which had reasonably priced food and friendly staff who took the opportunity to chat with us. We loaded up on carbs both choosing mains featuring papadelle pasta. After our first night at LKNZ Lodge we ate our muesli and drank coffee on the bus which collected us at 7am and dropped us at Mangetapopo Carpark where we set off for our 19.4km walk at around 8.30am. The first hour of the walk was pretty flat and often on wooden platforms. The tracks are all exceptionally well maintained by DOC but it is rated as a “challenging walk”, as well as the top day walk in New Zealand. The hike suddenly got harder with a steep climb up towards Mount Tongariro and past the turn off to climb Mount Ngauruhoe (aka Mount Doom from Lord of the Rings). At every corner you turn or peak you climb over the scenery changes completely. After the steepest climb you reach some amazing views of craters and the emerald lakes and it feels worth it. However to get down to the lakes you have to kind of ski your way down the loose volcanic rock. I probably took ‘challenging’ a bit lightly as I normally complete DOC tracks in a much faster time than what is sign-posted. But I did have 3.5 litres of water with me (there is nowhere to fill up) as well as plenty of food, warm and water-resistant clothing and sunscreen as I didn’t know what we were going to strike. Some people had little with them, there was a girl in jandals (!) and many pairs of jeans. One question which Google failed to answer for me was ‘what sort of shoes should I wear on the Tongariro Crossing?’. I didn’t have time to buy and work in hiking boots and as I have a stuffed left foot which requires special orthotics, my Adidas cross trainers were the best option. They got me through the day perfectly fine but would probably not have got me safely up and down Mount Ngauruhoe had I attempted that. We stopped for lunch by the lakes (amazing colours, you can’t drink the water in them due to the heavy mineral content), then we walked through the exposed and desolate Mordor. Ketetahi Shelter, which serves as temporary accommodation is 14km into the walk and had toilets and a deck with amazing views where we sat for a bit before continuing our way down the winding path. The last 3.1km was a particularly long and painful 45 minute stretch through bush to Ketetahi Carpark and we were grateful when we got there in plenty of time for our shuttle. While the scenery in the second half of the walk was perhaps not as amazing as that of the first, the whole experience was fantastic and I’m really glad I finally did it. Would you be keen to walk 19.4km between active volcanoes? Pin the image below to save this post for later! amazing post! Im planning to do the crossing next month! was 3.5L too much? how is the washroom situation? Thanks Gary! Feb is a great (although busy) time to do it. 3.5L was pretty perfect for me, had less than .5L left at the end so wouldn’t have taken any less than that. There are basic washroom facilities around the Soda Springs turnoff and at Ketetahi Shelter around two hours from the end. You want to hold your breath and go fast but they’re pretty well maintained. However, as an Aussie, I do need to point out that Australia Day sees just as many protests as Waitangi Day – especially since, unlike NZ (which was polite enough to name the day what it is, rather than keep it as “New Zealand Day”, which it was for a brief period), we celebrate the day of European settlement of the continent. “Invasion Day” is the second most common name for the day, so it’s not all celebrations! Wow that’s crazy! Your picture of the queue at the chain ascent made me laugh as I remember that spot well. Thanks for informing me on Australia Day too. Sooo many people! But still a great hike. And no worries – you only ever see protests in your own country (even as an Aussie, all I saw in NZ were celebrations of Waitangi Day). I think I’d put the Lord of the Rings audio book on and pretend I was on an adventure, living the book! Thanks for joining in #wednesdaywanderlust this week. Hope to see you back! Wow! What a walk! I haven’t done it even though I’m from New Zealand. Not sure if I’m fit enough! I seriously thought that for years, I think taking it at your own pace is the key. Certainly some of the people on the track should not have been there but they must have all made it out ok! This is a different to what I normally think of New Zealand. Usually I imagine green vegetation everywhere. This dry and at times lunar landscape offers some diversity. So true – it’s a bit like another planet up in the volcanoes. Thanks for sharing this. We are doing the walk next weekend. Well hoping to at least, when we tried last year the weather was too bad 🙁 But hoping for nice weather this time round! The walk looks stunning! Would you recommend that restaurant or anywhere else in Ohakune? That is where we are staying too. I would definitely recommend The Cyprus Tree! We also went to The Clyde Hotel which had pizzas, pub and mexican food which was pretty good. Amanda at LKNZ lodge recommended The Bearing Point but it was quite a bit more expensive for mains. Enjoy it and hope the weather comes to the party this time! 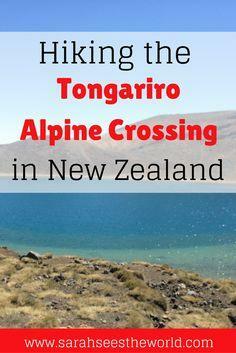 It’s so beautiful, I’d LOVE to walk the Tongariro Crossing one day. I think the mineral lakes are what appeals to me the most, they’re stunning. The lakes were the highlight for me and the perfect place to stop for lunch. The hard work walking up hill needs to be worth something!